Who Stole Our Game: The Fall and Fall of Irish Soccer is a really good analysis of all that is wrong and has gone wrong with domestic Irish football. Whelan begins back in the halcyon days of the 1950's when Irish football grounds were packed to the rafters for big League of Ireland matches. He descriptively conjures up images of the great rivalry between Shamrock Rovers and Drumcondra. He reminds those old enough to remember of the football dynasties that controlled important elements in Irish soccer back then. The Cunninghams and Rovers, and the Proles who owned Drums. While he suggests that sometimes the size of the crowds that attended matches is overstated there is no doubt that Association Football in Ireland was well established and appeared to have a secure foothold. Having reminded readers of the golden era of Irish soccer in a "grey landscape" he then devotes a chapter to each of the succeeding decades and charts the journey that the League of Ireland and it's clubs have taken since the good old days. In the book he draws comparisons with the other two major field sports in Ireland, the GAA and Rugby Union. Daire Whelan also analyses the adverse impact of the coverage of soccer on television, particularly English football, has had on the domestic game. Whelan focuses on Shamrock Rovers during the Kilcoyne era including the ultimately doomed John Giles project at Glenmalure Park. In a radical move Louis Kilcoyne and Johnny Giles introduced full-time soccer to the League of Ireland in a futile attempt to stem the flow of Irish football talent across the Irish Sea. Whelan reproduces extended quotes from Giles and Eamon Dunphy where they express their contempt and disappointment for the owners of the clubs at the time. Both of the RTE soccer pundits felt that sheer begrudgery stymied their attempts to improve the domestic game and that the individual clubs wanted to drag everyone down to the lowest common denominator. Whelan covers in detail the Kilcoyne decision to sell Shamrock Rovers spiritual home, Glenmalure Park for property development. He draws parallels with between the demise of Rovers during their nomadic period, and the League itself. It was as though the sale of the Milltown ground equated to the heart being ripped out of League of Ireland football. Daire Whelan constantly contrasts the forward-looking GAA and how that organisation worked assiduously at embedding GAA clubs in their local communities. He also profiles the radical approach that the IRFU adopted when confronted with the advent of professionalism and how that has paid dividends. While both of these organisations were adapting and moving with the times domestic soccer was stuck in an incoherent morass. Daire Whelan highlights a number of scandals and upheavals that have retarded the development and growth of football in Ireland. Significant events such as the so-called Merriongate affair, the infamous ticket scandal that involved FAI treasurer Joe Delaney and the mysterious George the Greek. Other events such as the Night of the Long Knives, the Commissioner, the Marney player registration affair, the Cass and Genesis Reports, and of course the Saipan Affair. And while all of this was going on the International team experienced unprecedented success during the Jack Charlton era with virtually no reference to the domestic league. Daire Whelan's book has it's flaws particularly in that it is overly Dublin-centric and readers might be forgiven if they concluded that there was no soccer being played outside the capital. Also Whelan's style is to include lengthy quotations from various main protagonists in the Irish soccer scene over the last 50 years. Some of the quotes are from unnamed sources. It would also have been helpful to know when and in what context were some of the quotations made. It is undoubtedly a soccer book but Whelan also creatively provides the social context particularly in the chapters dealing with the 1950's and 1960's. For anyone interested in domestic Irish soccer it makes for depressing reading especially when Whelan makes it clear that until John Delaney was appointed to the position of CEO of the FAI in 2006 the fractious nature of Irish soccer meant that the game suffered from an, almost, malevolent neglect while clubs and FAI officers engaged in political manoeuvrings. Daire Whelan concludes Who Stole Our Game with a very guarded optimism about the, then, proposed merger of the FAI and the League of Ireland however he he clearly had doubts about John Delaney as CEO of the FAI. He questioned his pedigree in that his father Joe Delaney was forced to resign due to extraordinary match ticket dealings. Whelan also harboured serious doubts about the manner in which John Delaney rose to the position of CEO. 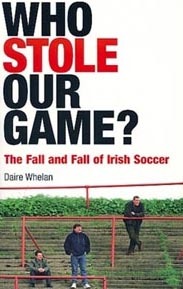 Who Stole Our Game: The Fall and Fall of Irish Soccer has it's deficiencies but I don't hesitate to recommend it to anyone that has any interest in domestic Irish football and how it got to where it is now. Daire Whelan is a journalist and a former sports writer for the Irish Times. He was also worked as a radio and TV producer in the past on Off the Ball and the Eamon Dunphy Breakfast Show on Newstalk, and on Sport Matters on TV station Setanta Ireland.